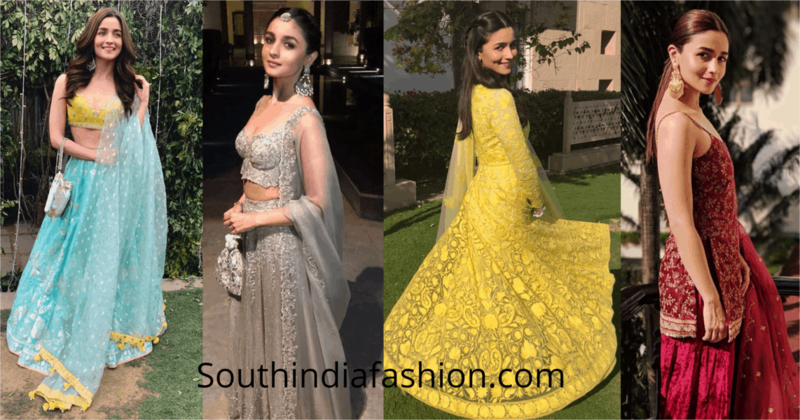 Take Cues From Alia Bhatt On How To Dress Up For Your BFF’s Wedding! Alia Bhatt is known for pulling off anything from a stylish couture creation to casual denim and t-shirt look like a pro. 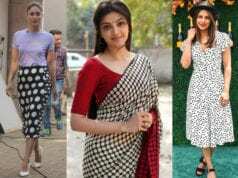 The stylish actress gave us some serious bridesmaid fashion goals on multiple occasions of her friends’ weddings. Each look she tried was different and we are in total awe with how she slayed as a trendy bridesmaid. The diva picked some lovely outfits and styled them with sheer perfection on all the wedding ceremonies. Her fashion game was totally unique, trendy and beautiful! 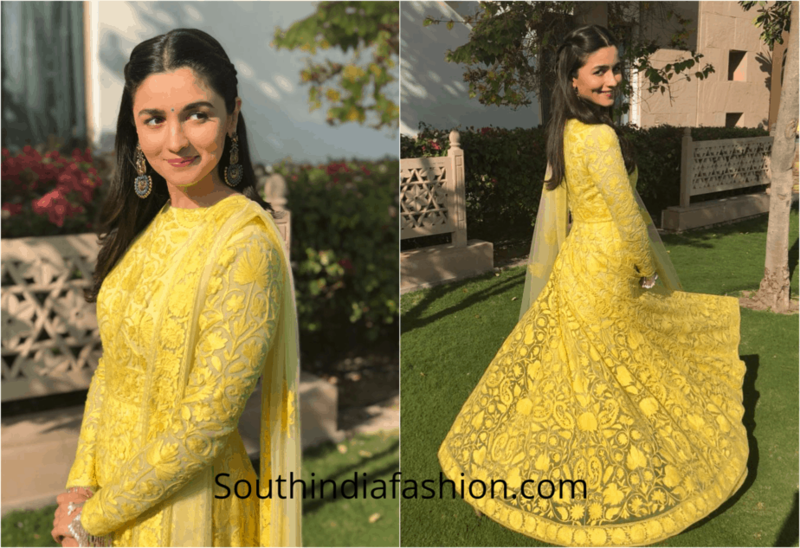 Alia opted for a beautiful sunshine yellow full flared Anarkali by Manish Malhotra. It was an all-over Kashmiri-inspired threadwork Anarkali. 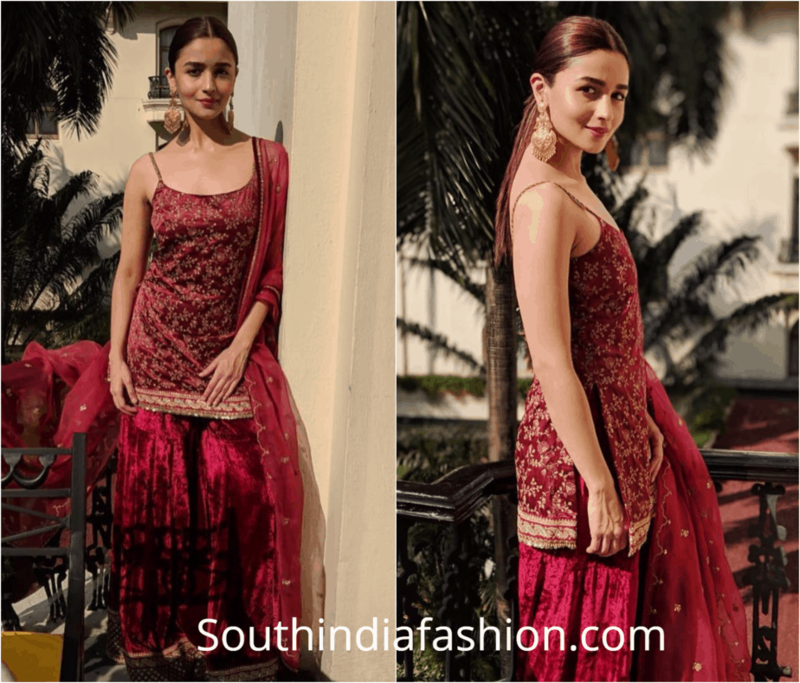 Alia kept the look simple with minimal makeup, tiny bindi, simple hair, and statement earrings. Alia Bhatt made a splendid statement with this finely embroidered sleeveless Sabyasachi sharara suit. Maybe it was the intoxicating maroon-wine shade or the rich velvet fabric; there was something magical about the ensemble. She kept the makeup simple with golden heavy earrings and sleek ponytail look. Alia Bhatt wore a stunning grey-silver colored embellished shimmery lehenga by Kresha Bajaj. To finish the lovely look, she donned a beautiful maang tikka and earrings by Amrapali and a matching potli bag by The Pink Potli. A perfect look for a Sangeet night! 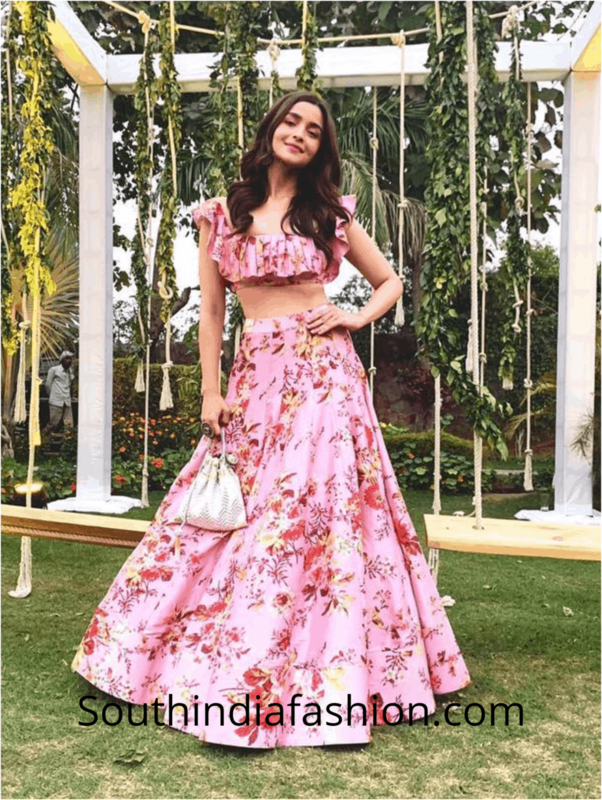 Alia looked like a breath of fresh air as she was all decked up in a floral print skirt and crop top by Anushree Reddy. The rose pink color with vintage rose prints all over outfit added a playful and fun vibe to her look. Keeping her hair in soft curls, Alia rocked the simple and elegant bridesmaid look. 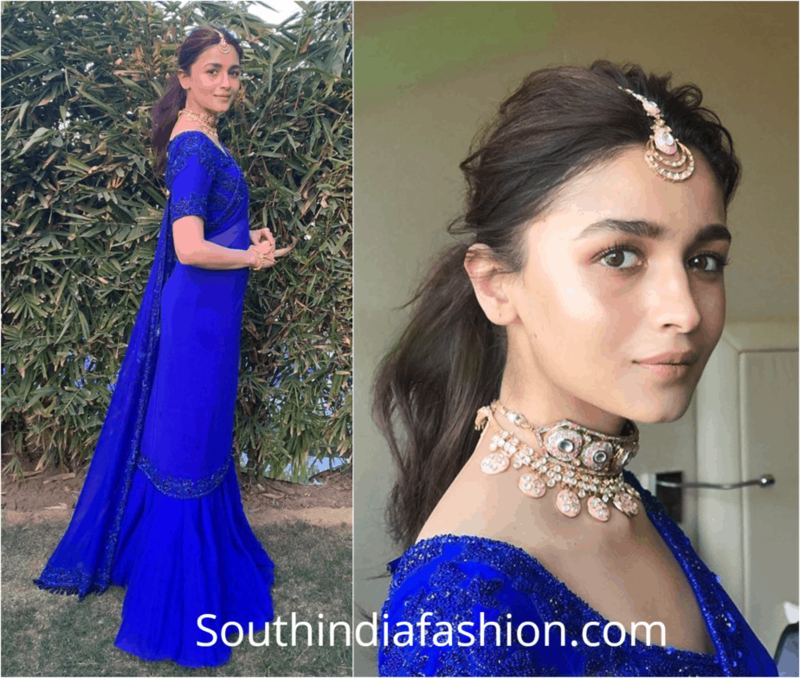 A royal blue monotone outfit by Manish Malhotra made Alia Bhatt look ecstatic! She made every head turn by dressing up in an experimental sharara saree in a striking electric blue color. We absolutely love the fact that she tried out the bold color. She ditched the earrings and wore a beautiful Meenakari choker and maang tikka. Cool blue with fresh yellow is like a blast of coolness and freshness! This beautiful quirky lehenga by Anita Dongre is perfect for a summer wedding. With beach-y wave hair, statement earrings and simple makeup she completed the look with a potli bag. Alia Bhatt definitely looked gorgeous in this fresh color combination. Another beautiful saree by Manish Malhotra! 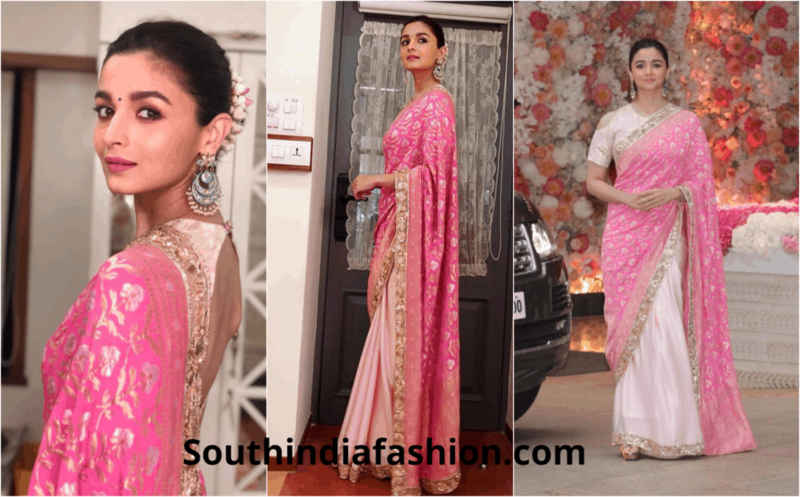 Alia wore a dual-toned pink saree and looked drop-dead gorgeous! To keep things girly and modish, she opted for a trendy blouse and kept light on jewellery. And a neat bun with some gajras finished her elegant look. 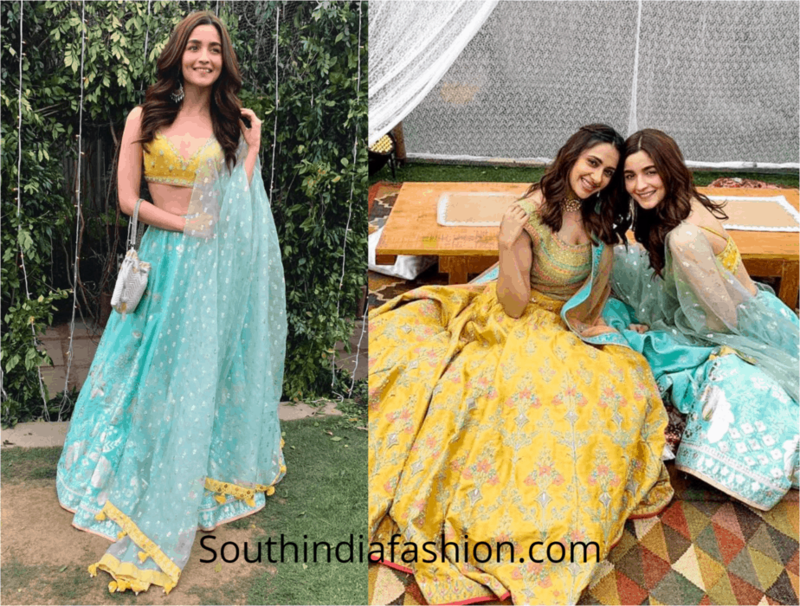 Alia Bhatt definitely set some inspiration worthy bridesmaid looks! That’s the kind of fashion statements Alia makes every time she flaunts ethnic outfits. Let us know which one of these bridesmaid look would you love trying out.